As stocks and currencies fell around the world last week and into today, even those living in the United States took notice as the bubblicious S&P 500 turned a strange color of green (it was red). The headlines now read that we have an "emerging markets crisis." Investors, we have been told, should take cover and run back into the safety of the DOW. Will they do so? Perhaps. Will joining that herd provide strong long term results? Let's take a look. While high P/E ratios do not mean that stocks will fall tomorrow, they have historically led to disastrous returns for investors over a 1, 5, or 10 year span into the future. 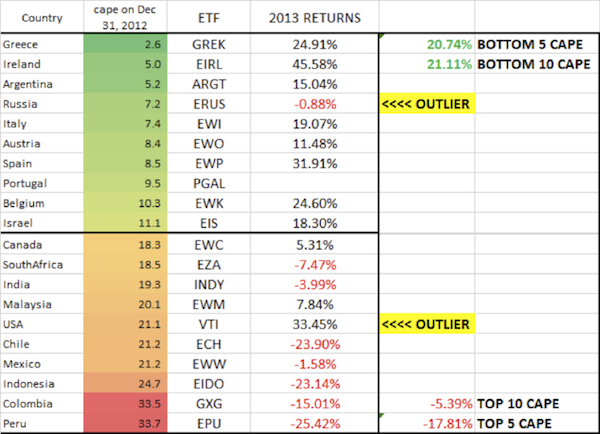 The next chart shows where the P/E ratios stood entering 2013 and the market performance over the last year in those markets. 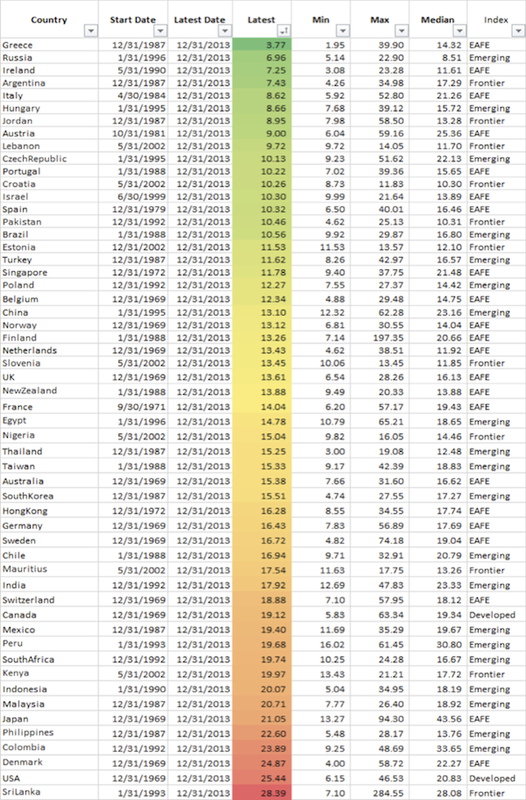 You can see that in general, the countries with low P/E ratios (inexpensive markets) performed well while the countries with high P/E ratios performed poorly. The two outliers were Russia, which had cheap stocks that became cheaper, and the United States, which had extremely expensive stocks that became much more expensive. Have we entered the next contractionary period for the global economy? That is unknown and only the data will tell as we move forward. However, if we have, and we see continue to see an across the board sell off in stock markets and currencies globally, it is important to remember which markets represent true long term value (emerging markets) and which may only be correctly down closer to fair value (the U.S.). Tuna, what are your thoughts about Turkey's recent dramatic interest rate hike? What are the implications globally, if any? The media is in a frenzy over the recent 30 percent decline in the Turkish lira against the dollar. What is not discussed is that the Turkish lira has fallen 30% (or more) against the dollar 6 times since 2000. The situation will only escalate if significant losses arrive on bank balance sheets that trigger a contagion effect with other inter-connected banks around the world. Until then, don't even pay attention.